A faculty meeting. The evening before everything formally begins. It takes about ten minutes to get everyone in the room, to arrange the chairs the way we want them, that kind of thing. In a lot of contexts, we would have spent those ten minutes kibbitzing, or possibly kvetching about our travel experiences or whatever's not going right in our day. Not here. Rabbi Shefa Gold opens up her sruti box and begins singing a two-part Sim Shalom round. (One of her own chants, naturally.) The music builds as we all pick up the melodies. Soon we're singing it as a round. The melody ripples and swells in the bright and airy room. By the time the meeting begins -- a good ten minutes later, but no one minds, because the singing feels like prayer -- the energy in the room has shifted and I feel I'm part of something bigger than myself. Looking at the schedule for Tuesday morning davenen. There are several options: Yoga Shalom (the service interwoven with yoga), Davennen in the Vernacular (davening in traditional nusach -- but in English), Davennen in Nature through the Torah of Metaphor. It's hard to choose. 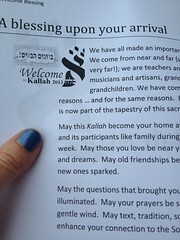 That's Jewish Renewal in a nutshell right there. Speed-daven all of the words in the siddur as fast as you can, considering it a form of ancient meditation -- or strip the whole service down to the six words of the first line of the Shema. Neither approach has to cancel out the other. Both are ways of approaching the Divine. I have every intention of going to mincha (afternoon services), but it's a ten minute walk away in the rain, and I stop to say hi to someone I haven't seen in a long time, and then someone else, and next thing I know, I'm too late. Instead I wind up hanging out with two friends by the bank of enormous windows at the back of the building where the shuk is. One of us starts singing the ashrei, the first prayer of mincha, and next thing I know, we are quietly singing and harmonizing and making our way through the whole short liturgy of the afternoon service. Around us, people are still wandering, browsing beautiful tallitot and kippot and books and jewelry, chatting, hugging, catching up. And we're davening by the windows overlooking the rain and the lake. I'm reminded of seeing Orthodox men in black davening at airport gates, at the banks of windows overlooking the runway, before a night flight. We would look strange to them, I suspect: we are two men and one woman, me in a tank top, all of us barefoot ("take off your shoes," God told Moshe, "for the place where you're standing is holy ground"), laughing along with our davenen. The interplay of our voices and our spirits is tight and sweet. Even while it's happening, I know it's something I don't want to forget. Rabbi David Ingber has chosen to frame the opening plenary as a Hasidic-style tisch, a table gathering in which the rebbe's teaching is framed with niggunim and melodies. After a beautiful ma'ariv service led sweetly by Rabbi Jack Gabriel and a bevy of musicians, we fill the stage in the big tent with musicians of our own and we sing a Chabad niggun. 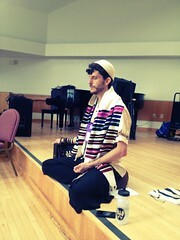 There is drumming (Akiva the Believer and Shoshanna Jedwab -- my cup runneth over! ), there is guitar, there is piano, there is clarinet -- and there is a tent full of several hundred happy people singing. Soon there is spontaneous dancing. It is amazing. It feels like a tent revival. A happy, hippie, neo-Hasidic, egalitarian, feminist, queer-friendly tent revival. Reb David introduces the notion of the plenary as tisch, and quips that it is a plen-isch -- and since we're Renewal Jews, it's a re-plen-isch. (Get it?) But against all odds, the evening really does feel replenishing. I share poetry and musings. Rabbi Riqi Kosovske shares a classical nursing prayer. Rabbi Ebn Leader sings "Memaleh kol almin, u-sovev kol almin" -- "You fill all worlds and surround all worlds, and without You there is no existence at all" -- so soulfully that I get shivers. O Zion, more love, more love. To close, Rabbi David Ingber tells an extraordinary story about why there is a tiny א in the first word of the book of Vayikra/Leviticus: that after Moshe built the mishkan, the tabernacle, he stood outside it and wondered, is there a place here for me? I did all this work, I made this thing, but do I belong here? And God whispered so that only he could hear: come on in, Moshe. There's room for you. What a metaphor for us here in the big tent of Jewish Renewal. Come on in. There's room here for you. 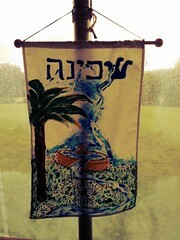 In the small chapel space, my dear friend David leads the six-word Shema-focused davenen. We create a sonic tapestry without any plan or intention, and it fills the space, and it is beautiful. We move through hearing: hearing with our ears, our bodies, our skin as interface with the world. We move through what it means to be Yisrael, standing, energizing our feet, entering into movement. (That's the most challenging part for me, but I try.) We embody the Yud-Heh-Vav-Heh with our bodies, conscious of immanence. We experience relationship with God. We connect with the Yud-Heh-Vav-Heh of transcendence, God beyond us, stretching our awareness beyond our bodies. And we break the final echad, One, into its component letters: forming the aleph with our bodies, rumbling a room full of chets, tasting the Spanish sound of the un-pointed daled. We chant two different full shemas -- the "Reform summer camp" melody I use at shul (which feels and sounds entirely different to me in this space, accompanied by sruti box) and the triumphal Sulzer chant a cappella. The Sulzer shema comes near the end of the service, and it rings out like a heavenly shofar, energized by our deep explorations. It's not quite like any other davenen I've ever done. What a gift.